One thing that I experienced on my darkest season is the complete love of others and from our Lord. He does so much for us to help us through our tribulations if we only seek and ask. I purchased myself this bracket today for my present from my husband. He likes to give me money and I pick out my gift. Rather ingenious on his part, He never gets it wrong! I looked at all they had to offer and this just stood out. 1 Corinthians 13:8. Love never fails. What a powerful statement. In all things love keeps us going. It is given to us from friends, family, strangers, and from our Lord on a daily basis. Love is what keeps us moving through life with out being wiped out by the negativity and the tribulations we will go through. 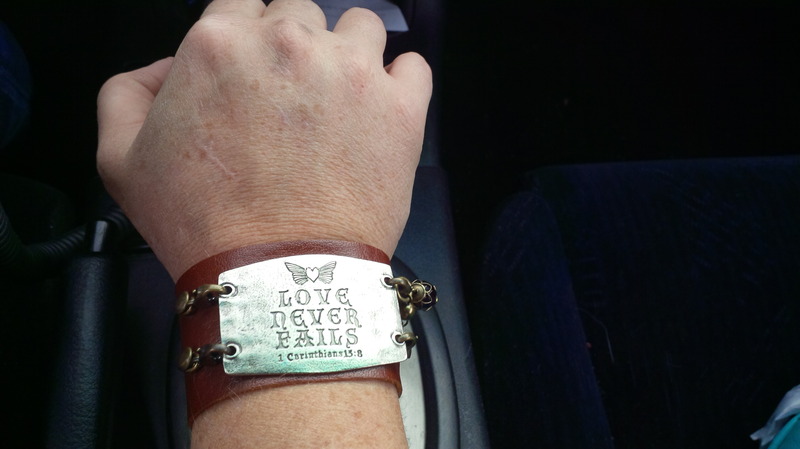 This bracelet reminds me that with love all things will succeed. But we need to give love to help others to keep from failing. Our love is a gift and at any moment we may have friends and family who are going through a season that is extremely difficult, and when we give them that little ounce of our love it may change everything for them. Next Article Winter Wonderland and Mom’s Creamy Potato Soup!